UPDATED: Norwegian Justice Minister Tor Mikkel Wara felt compelled to resign his top government post on Thursday, after the country’s police intelligence agency PST expanded an ongoing case against his own live-in partner. PST now thinks she’s behind all the threats lodged against the couples’ home in Oslo since December, and that she sent a threatening letter to another top government politician. PST (Politiets sikkerhetstheneste) now believes Laila Anita Bertheussen, who has lived with Wara for 24 years, fabricated all the incidents that were viewed as threats against the justice minister. She had earlier been charged with being behind only one of them, when Wara’s car was set on fire while parked in their driveway earlier this month. PST posted a notice on its website Thursday afternoon reading that “after a thorough evaluation based on technical and tactical evidence, PST has changed Bertheussen’s status from victim to suspect in all the incidents,” apart from the one with which she’s already charged. Shortly thereafter Prime Minister Erna Solberg held a press conference Thursday afternoon. Standing next to Wara, she said Wara had told her earlier in the day that he wanted to resign. She said his request would be granted. She called the situation “demanding” and one that she would “gladly have been without,” also that she was “genuinely sorry” about the chain of events and alleged threats that led to his resignation after only a year in office. He had replaced another Progress Party politician at the time, Sylvi Listhaug, when she was forced to resign for her unwarranted terrorism accusations made against the opposition Labour Party. Wara has been on paid leave for the past two weeks and was due to return to work next week. Solberg refused to say whether he could have come back if he’d wanted to. As justice minister he’s politically responsible for not only PST and Norway’s state police but also for the entire justice system including prosecutors and the courts. Many believe he quickly would have found himself caught in a conflict of interest as the investigation of his partner continues and may go to trial. She has denied the initial charges filed against her. Solberg had described the situation as a “personal tragedy” for Wara and his family at the earlier press conference she held with Progress Party leader Siv Jensen, just after the initial charges were filed against Wara’s partner. Jensen had said she was “shocked” by them, as was Solberg. Wara refused to comment on the “personal tragedy” characterization, also refusing to answer most all other questions posed at the press conference. His partner is now suspected, among other things, of having vandalized the family’s own home, tagging it with swastikas and the Norwegian word for “racist” that was misspelled as “rasisit,” as if someone not familiar with the Norwegian language was to blame. Wara is a member of the Progress Party that’s been trying to restrict immigration for years, and opposes more refugees gaining asylum in Norway. Bertheussen, Wara’s partner, has also reacted angrily in recent months against a small theater production of a play portraying immigrants looking for the sources of racism in Norway, and allegedly finding them at the homes of people tied to the Progress Party, the Conservatives, NATO and the right-wing website Resett. The home shared by Wara and Bertheussen was among them, and she complained strongly in both social- and professional media that she felt her privacy had been invaded. Bertheussen had also reported the theater and its play’s director to police, blaming them for her discomfort, but charges were dropped after an investigation. Bertheussen now must defend herself against not just setting fire to Wara’s car but also with the alleged tagging and vandalism, also setting fire to her home’s garbage bin, spreading flammable liquid under a family car on an earlier occasion and sending threatening letters to the house, all to make it look like Wara was being threatened. NRK and newspaper Aftenposten reported on Thursday that Bertheussen is also suspected of sending a threatening letter to the home of Wara’s government colleague Ingvil Smines Tybring-Gjedde, who serves as Norway’s minister in charge of preparedness. Tybring-Gjedde and her husband Christian Tybring-Gjedde are both members of the conservative Progress Party and the letter made it look as if someone was threatening them as well. Police response to all the alleged threats has been massive, and both Wara and his family have received lots of sympathy and support not only from government colleagues but also opposition politicians in Parliament. Wara expressed gratitude for the support after the threats that now may never have existed. His partner is specifically charged so far with fabricating an alleged crime, and that may be expanded, but her defense attorney indicated late Thursday afternoon that she’s ready to deny any additional charges. John Christian Elden even told Aftenposten that he thinks it’s good that she’s suspected of all the alleged threats. 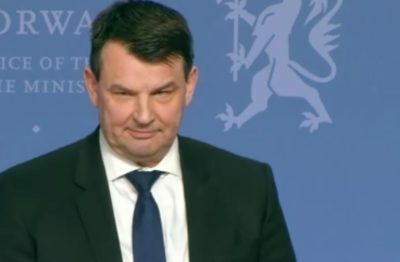 Solberg, meanwhile, said that Transport Minister Jon Georg Dale would continue to serve as acting justice minister as well until a replacement is named. Solberg would not say whether the Progress Party would retain the justice minister’s post in her coalition government. Given the recent trouble with several Progress Party ministers, calls have gone out for Solberg’s Conservatives to take over responsibility for the important post. Dale is the sixth Progess Party politician to now serve as justice minister in as many years. 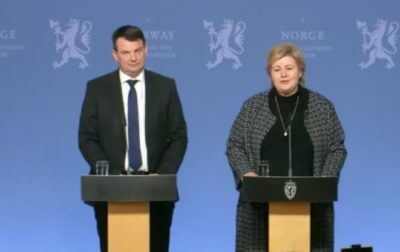 Solberg admitted at the press conference that she “of course” would have preferred more continuity, citing some “very special circumstances” behind much of the turnover. She was meeting with her cabinet this week and a new justice minister, who must formally be appointed by King Harald V who’s currently on a state visit to Chile, is likely to be presented as soon as possible.